“Les Surprises de l’Amour, transcriptions de Monsieur Hesse.” Jean-Philippe RAMEAU: Les Surprises de l’Amour (1748, rev. 1753, 1757, 1758; arr. Ludwig Christian HESSE, ca. 1767). 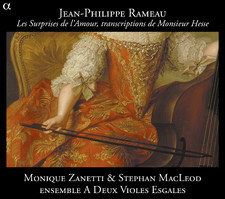 Monique Zanetti (sop), Stephan MacLeod (bar), Ensemble A Deux Violes Esgales: Jonathan Dunford, Sylvia Abramowicz (viols), Pierre Trocellier (hpsi). Alpha 176 (1 CD) (http://www.outhere-music.com/en/labels/alpha). As a late 18th-century opera composer, Rameau’s popularity spread through Europe. At the German court, violist and composer Hesse fashioned an arrangement of Rameau’s ballet-opera for two viols. Hesse’s father had studied with Marais and Forqueray. The transcription might sacrifice lines; nevertheless, the effect, scored for two viols plus continuo with occasional soprano and baritone, convinces. Rameau frequently altered the work, adding and removing acts for new venues. The four parts are: L’Enlèvement d’Adonis, Anacréon, different from the full opera with the same name, La Lyre Enchantée and Sibaris. Contemporary audiences would never have heard all four parts in the same evening. We are more fortunate. Violist/scholar Dunford brought this rarity to light. I hear a bit of La Pantomime in the Ouverture to L’Enlèvement d’Adonis. “A Choice Collection of Dances. Music for Baroque Dances at Court and Theatre.” Var. comps. Accademia Amsterdam. 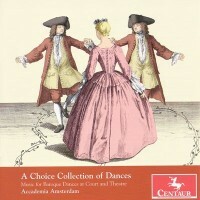 Centaur CRC 3167 (1 CD) (http://www.centaurrecords.com/). Because our experience of Baroque music is predominantly through recordings, it’s easy to forget the music’s original function. The wonderfully balanced players of Accademia Amsterdam provide over 30 dances in tempos which correspond to period choreography. Instead of aggressive briskness we get purposeful leisure. Dorothée Wortelboer did the detective work and provides detailed notes. Grouped into several suites, “Dances for the ballroom,” “Dances for the theatre,” etc., most pieces are short. Composers include Campra, Charpentier, Hotteterre, Lully, Marais, Mouret, Rebel, et al. I’ll keep an eye out for Accademia Amsterdam’s next project. 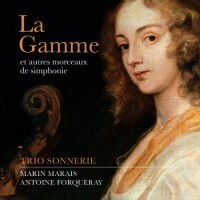 “La Gamme et autres morceaux de simphonie.” Marin MARAIS: La Gamme en forme de petit Opéra; Sonate à la Marésienne; La Sonnerie de Sainte Geneviève du Mont de Paris (1723). Antoine FORQUERAY: Pièces de viole, avec la basse continue: Suite No. 1 (1747). Trio Sonnerie: Monica Huggett (vln), Emilia Benjamin (viola da gamba), James Johnstone (hpsi). Linn CKD 434 (1 CD) (http://www.linnrecords.com/). Marais’ entire 1723 publication appears: The four-section La Gamme, the Sonate à la Marésienne and the chaconne Sonnerie de Sainte Geneviève du Mont de Paris built upon a mesmerizing D-F-E bass line. Both La Gamme and the Sonate are relatively large pieces for those used to Marais’ suites. Sonnerie portrays a town’s inhabitants starting their day as bells toll. La Gamme explores paths as it climbs through many keys. Huggett sits out the Forqueray wherein Benjamin and Johnstone vary solos and duets (La Laborde, La Bellmont and La Portugaise are harpsichord solos, La Forqueray, La Cottin and La Couperin are duets). The combinations sustain interest, and yet I’d have liked to hear the viol in all six pieces. Perhaps they included the Forqueray to bridge the gap between the 35-minute-plus La Gamme and the popular proto-minimal Sonnerie. 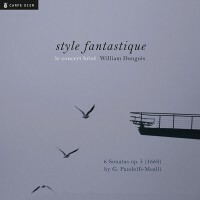 “Style Fantastique.” Giovanni PANDOLFI-MEALLI: Six Sonatas, Op. 3 (1660). Johann Jakob FROBERGER: Lamentation faite sur la mort très douloureuse de Sa Majesté Impériale, Ferdinand III, FWV 633 (1657); Toccata No. 3 in G major, FWV 103 (1649); Suite No. 1 in D minor, FWV 602 (1649, arr. Éric BELLOCQ). Le Concert Brisé: William Dongois (cornetto), Carsten Lohff (hpsi, org), Éric Bellocq (lute). Carpe Diem CD-16280 (1 CD) (http://www.carpediem-records.de/). Le Concert Brisé offers a convincing 17th-century visit as a reminder among other pleasures that there’s always room for flexible interpretations. Dongois plays the straight cornetto (or cornett, not the prepackaged ice-cream desert), essentially a wooden pipe with holes and a cupped mouthpiece. The strident sound, like that of an oboe or trumpet, is well captured in these live recordings made at the Musée d’art et d’histoire de Neuchâtel, Switzerland. Lute and continuo support, the latter predominantly a 1632 Ruckers enlarged by Blanchet in 1745, with the occasional organ. Even if violin is the more customary soloist for the Pandolfi (e.g., Manze on Harmonia Mundi HMU 907241) the ear quickly adjusts to Dongois’ rewarding virtuosity. Froberger provides contrast, presumably as a chance for Dongois to rest. 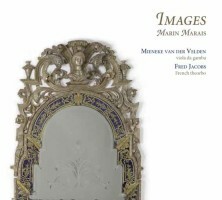 “Images.” Marin MARAIS: Var. pieces. Mieneke van der Velden (viola da gamba), Fred Jacobs (French theorbo). Ramée RAM 1205 (1 CD) (http://www.ramee.org/). A delightful and thoughtful gamba-plus-theorbo combination features 23 pièces from Marais’ books II through V arranged in similarly keyed suites, three of which start with solo theorbo préludes, one by Estienne Le Moine and two by Robert de Visée. Without bustling continuo or a second gamba, the soloist has plenty of elbow room. Savall’s Marais presentation is excessively glamorous and grouchy by compare. The selected rondeaus which close several suites are bright and vigorous. The French theorbo, closer to the lute, is apparently smaller than the more common Italian type. Presumably its higher range is another reason why van der Velden is so vivid. “Dom Quichotte: Cantates & concertos comiques.” Michel CORRETTE: Concerto comique V, “La femme est un grand embarras” (1733); Concerto comique XXIV, “La marche du Huron” (1773). Pierre DE LA GARDE: La Sonate (ca. 1757)*. Marin MARAIS: La Sonnerie de Ste Geneviève du Mont de Paris (1723). Nicolas Racot DE GRANDVAL: La Matrone d’Éphèse (publ. 1755)*. Philippe COURBOIS: Dom Quichotte (1710)*. 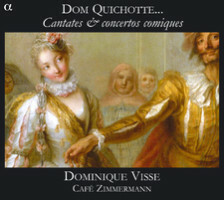 Dominique Visse* (c-ten), Café Zimmermann: Pablo Valetti, David Plantier (vln), Diana Baroni (fl), Peter Skalka (vlc), Guido Balestracci (viola da gamba), Éric Bellocq (lute, Baroque guitar), Céline Frisch (hpsi, org). Alpha 151 (1 CD) (http://www.alpha-prod.com/). Café Zimmermann can always be counted upon for a distinctive and well-executed program. Countertenor Visse plays every role in de Grandval’s comic cantata about a widow sitting vigil and her unexpected romance with a soldier guarding an executed criminal’s corpse. La Sonate is a humorous characterization of a rehearsal, whereas the Don Quixote story supports the delusional knight errant with serious styles. Originally intended as interludes between staged productions of comedies incorporating rustic and popular tunes, Corrette’s concertos are hardly slapstick. Marais’ hypnotic Sonnerie might be the most serious item here. Café Zimmermann executes with flair. Where are the rest of the Corrette concertos? Surely there must be more repertoire to showcase Visse’s comedic versatility.